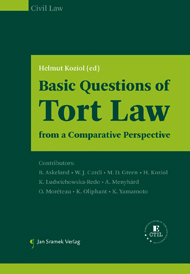 The starting point for this project on the » Basic Questions of Tort Law « was the book written by Helmut Koziol, the » Basic Questions of Tort Law from a Germanic Perspective « (Sramek Verlag, 2012), a volume which presented an introduction into the law of torts from a Germanic perspective. Colleagues from seven countries were then invited to give critical responses to the ideas presented in the 2012 volume. The comparative law conclusions then attempt to pick up on the ideas expressed in the legal systems examined and to make them amenable for debate on the further development of the legal systems and their harmonisation. Obviously, it was not possible to respond to all of the valuable thoughts contained in the country reports. Above all, the focus was on ideas that have not yet been discussed very often and also on providing impulses in relation to legal policies. It was fascinating that often the national responses to law of damages issues at first gave the impression of being less than appropriate but then in relation to basic ideas within the respective legal systems and in interplay with other legal institutions, for example social security law, they turned out to have good arguments in their favour. Moreover, there were sometimes additional features in yet other legal systems that supplied ideas for how to further develop a not-yet persuasive solution and which ultimately led to surprising, new basic concepts, which could deliver valuable ideas for the development and harmonisation of the European law of damages. Thus, it was possible to develop in the area of personal injuries a proposal for a new kind of interplay between the law of damages, liability insurance and social security, which could offer many benefits.